Capcom's Ghouls 'n Ghosts series is held in high esteem by many a retro gamer, yet the franchise is currently dormant and we're unlikely to see a sequel any time soon. 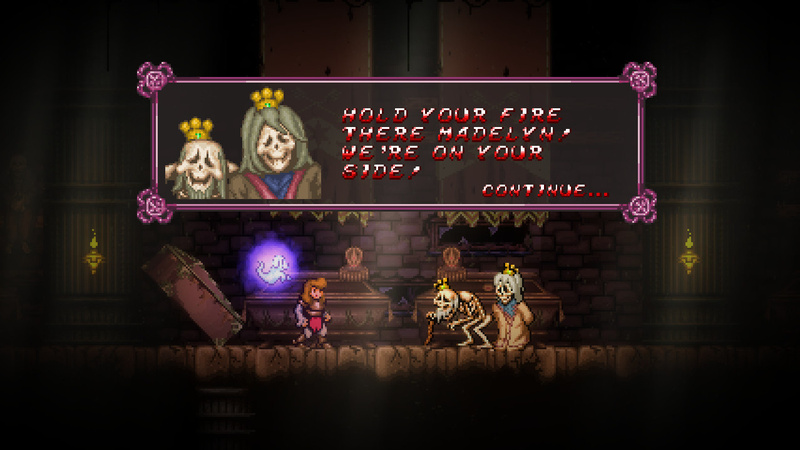 However, we may be getting the next best thing in the form of Battle Princess Madelyn, a spiritual successor created by Causal Bit Games and currently doing the rounds on Kickstarter. Keen to know more about the game and its upcoming Switch and Wii U ports, we spoke to Causal Bits' Chris Obristch to find out more. Nintendo Life: Can you tell us a little about your studio and your previous games? Chris Obristch: Causal Bit Games is Canada-based. Lina and myself (as well as Madelyn and Sofia of course!) are located in Nova Scotia and Daven is out in Ontario. Daven Bigelow and I have been working together remotely for roughly five years now. We started our company to make our first game together, Insanity's Blade. I myself have worked on several published games outside of CBG. 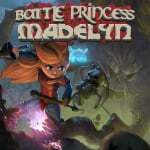 How did you come up with the idea for Battle Princess Madelyn? It's mostly my daughter Maddi's fault! She wanted to be in Ghouls 'N Ghosts, so she got it! Though we find those games to be a bit on the short side and lacking in story we knew they could be extended into full console-quality games. After I had initially started the prototype, I began tinkering around with a few story ideas with Maddi's help. She picks the locations and the levels for the most part! Often her input boils down to "I want to fight a giant zombie in a haunted house" kind of thing most times. Other times she'll give me a full on battle plan for a boss, which is incredible for a little kid! Then again - she sees me playing these games all the time and often plays them herself now. I guess having a game developer/designer for a dad has her picking up on what I do. But at this point I literally have a stack of art and level ideas she's drawn to go through and convert into in-game assets. 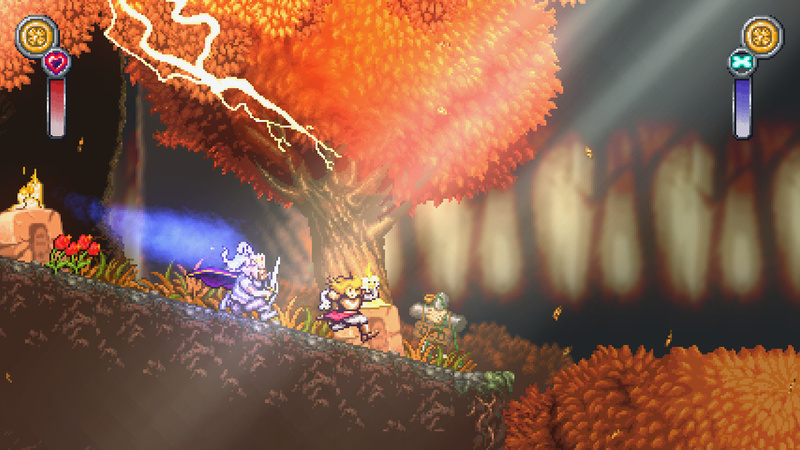 You've been very open about the Ghosts 'n Goblins influence with Battle Princess Madelyn. What makes that series so appealing to you as a player? The atmosphere, the goofiness. It's hard as nails, whilst not taking itself too seriously. I think I was about ten years old when that game hit the arcade. Both that and Ghouls 'n Ghosts are still in my top ten games of all time! Though, aside of the NES version, I've never really found the game that hard, to be honest. How would you say that Battle Princess Madelyn improves on the core template laid down by Ghosts 'n Goblins, and its many sequels? It's far more than a regular GnG style game. It's really only based on it control wise. Fritzy, Maddi's ghostly pet, aids you in puzzle solving with his unique abilities that are unlocked and switched between in real-time. That kind of puzzle solving is something that just isn't in GNG. One level, with its three main stages and up to 2 hidden stages, has as much gameplay in it as an entire GnG game would. There's a huge story tied into the game, armour that allows you to traverse specific parts of stages, and so on. The controls aren't quite the same either actually; you have a lot more control over Maddi than you would over Arthur. There will also be other sidekicks accompanying Maddi. The toy room is another aspect that expands upon exploration aspects in the game. It's used for collecting the miniatures of the different characters and beasts Maddi will meet in the game. The overworld map also allows you to replay stages, go to towns and get side-quests - and on that note yes, there are side-quests! 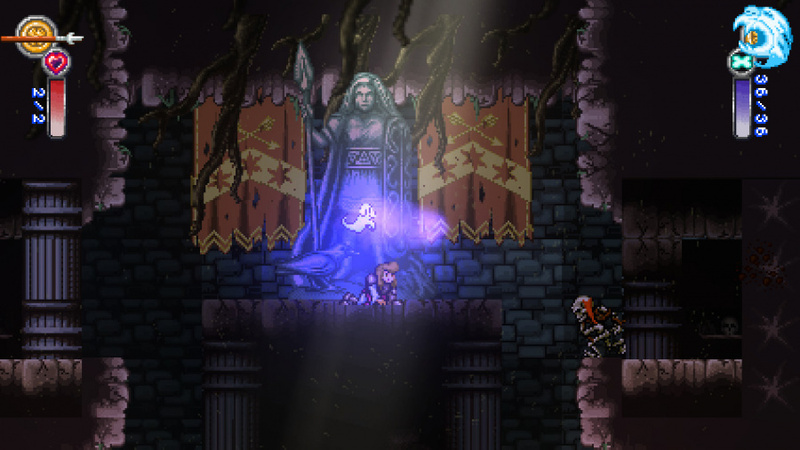 What aspect of Battle Princess Madelyn are you most proud of? The fact that Maddi is helping so much on a game made for her - I'm proud of that, and of her the most! I'm proud of her for inspiring her Daddy as well! I've never had a drive like this to work on anything ever before! Our entire team is so inspired by her and the story behind the game that everyone is throwing their hearts into the work. It's just a wonderful team making Maddi's ideas come to life together! What does you daughter make of the game, given that she's the main source of inspiration? She loves it! She's doing exactly what she wants to do - fighting monsters in a video game. She absolutely loves drawing up monsters and level ideas for the game. I think at this point she's way ahead of me! What's it been like working on the Switch, and with Nintendo itself? We can't comment on this just yet, but we're excited by the hardware and the possibilities. But we'll say more when something ready to share with the public! 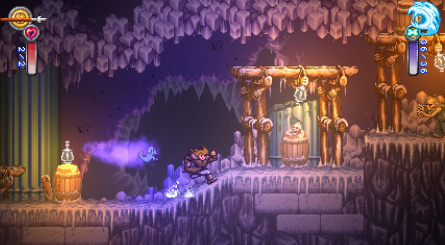 Will Battle Princess Madelyn make use of any of the console's key features, such as HD Rumble and same-screen multiplayer with two Joy-Cons, or is it going to be the same version across all formats? There is no multiplayer planned for this game, we had learned from our past title Insanity's Blade that it dramatically alters the game from the original vision. We will be doing HD Rumble, but essentially it'll be the same version across all formats. Could you see yourself making a game exclusively for the Switch which made use of its unique features? We don't have any ideas that would be exclusive to the Switch at the moment, but who knows what the future holds! As an owner of a Switch, I'm definitely interested in pursuing the possibilities after we get a few more game ideas off our back-burner. That doesn't mean we aren't open to Switch-specific features in our future games too, of course! Your crowdfunding campaign has met with an overwhelmingly positive response and has hit its targets incredibly quickly. What's the feedback been like from backers so far? The feedback has been generally amazing! We have received a lot of positive mail about the game's back story and how we are handling the story in the game itself. What we're really glad to see is all the backers playing the Pre-Alpha and getting even more excited! We ultimately wanted to make an amazing game, both for Maddi and all our backers, and so far it seems we are delivering! Last time we spoke to you it was about Insanity's Blade, which was due to be released on the Wii U. What happened with that? Although we never met the Wii U stretch goal, we still tried to do a Wii U port after the Kickstarter. Initially we had the game completed in the Construct 2 game engine - which, based on the advertising when we bought it, was supposed to export to the Wii U with HTML5 and WebGL. However, when we got the dev kit it ran at about 10fps and bugged out terribly. There was nothing we could do about it, as we had no control over the engine. We had a dev under contract to do a Unity port but that didn't pan out well so we had to cancel the contract. It's important to note though that it was not the Wii U that was the issue here though, and thanks to the flexibility of the Unity engine we are looking forward to Battle Princess Madelyn's release on Wii U as well as Switch! Battle Princess Madelyn launches on Switch, Wii U, PS4, Xbox One and PC early next year. there are those who think that putting female leads in a game is "political" or "pandering." then there's those who understand that such a small gesture can make a person's day, maybe even change their life a little bit. this game deserves high praise. I much prefer this type of kickstarter where a good portion of the game is already done but extra money would be nice for more platforms/bonuses. Although while the game looks nice I wonder how much of the old game will be inside it? I expect difficulty to be reduced after all it is made for a little girl. I'm not sure he could really get away with anything but being open about the Ghouls 'n Ghosts influence! This looks really good. Had heard about this before, but never took the time to take a proper look. Will most definitely keep an eye on this one! @ieatdragonz What old game? The only thing around previously was a prototype.. I love the backstory for this game. When I first found out about it the kickstarter goal was already met and almost all the stretch goals too but I still wanted to back it so I did. Can't wait for it. @EternalDragonX I think it is going metroidvania style. They mention you can backtrack through levels and exploration is a big part of it. Given the interview mentions special armor and fritzy's abilities that indicates a very metroidvania style game. Not sure about an overworld but I think you're getting a lot of what you want. Whoa, a Nova Scotia-made game! I'd buy it to support that, even if it didn't look good. Luckily, it does so it's all good with me. This game looks great. I love how the daughter is coming up with wild ideas and he finds a way to put it in the game. I like the look of this game. I'm cautious about the concept. While I understand the desire to stretch the experience out so it's not too short, I find it's a tough balancing act as games like this can be too long and have too much stuff. I'm not the type who loves to explore and I hate when it's easy to get lost. With that said, Shovel Knight is a good example of a 2d side scroller that is stretched out in a fun way. I hope this one is like Shovel Knight in that way. I'll keep an eye on it. "The overworld map also allows you to replay stages, go to towns and get side-quests - and on that note yes, there are side-quests!" This game looks beautiful. I love the background visuals. It looks modern while still respects the retro snes style. Wow, just watched the video - this is absolutely stunning! Incredible sprite work and effects. Attention to detail is superb. Will be picking this up for sure! @markie7235 Correct, the difficulty will scale to the player's skill. I have Insanity's Blade on PC, and it's pretty fun. It's a true homage to late 80s, early 90s ultra violent arcade platformers like Rastan and Black Tiger. Personally, I often enjoy having a female protagonist in a game. One time I heard the term of "Lara Croft syndrome" where if you're a male gamer watching a character's backside on screen for hours, you prefer it be an attractive woman. Seriously though, I also like Samus Aran, and non-sexualized female leads - If they are good characters. I remember playing Ghouls 'n Ghosts. It was so hard I wanted to throw it in the trash. I want entertainment not banging my head against the wall. 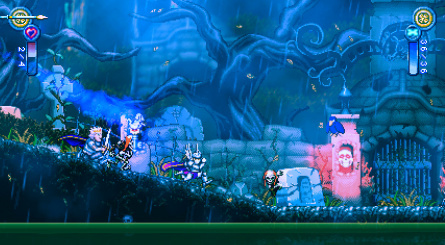 And Battle Princess Madelyn does look nice and plays very similar to Ghouls 'n Ghosts. this looks awesome, I'll definitely purchase once it's out. love the interview with the company and the inspiration to include his daughters ideas. this looks so nice, just watching 5 mins of the video has me hooked and wanting to play. Ducktales Remastered... Shovel Knight... Freedom Planet... now this SPECTACULAR looking game. It seems that other companies are now doing Capcom better than Capcom. From Canada and part of the team is located in my home province of NS! I will definitely get this as I love ghouls n ghosts. This article reminded me of Insanity's Blade. 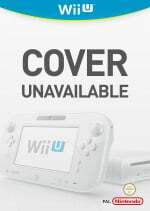 I followed the news here about it, but since it never came out for Wii U, I lost track of it. A shame about the problems with the game engine. Having been reminded of it, I saw there were no Linux or Mac versions as originally intended. I looked into it and it looks like the issues with the game engine were involved there as well. A shame as I'd have liked giving it a shot, but I run Linux on all my machines now. The good news is they've changed game engines. As I stated earlier, I'm cautiously optimistic about this one. I like the way this looks and runs, but I'll need more information on how it's designed before I buy. I'm not sure it will be the style of game I enjoy. I look forward to learning more about it over time. Then there's the matter of specs. Insanity's Blade for Windows had some surprising system requirements and the most powerful system I have is running a laptop Core i5 from several generations back. I don't know if having a female protagonist is that unique anymore. He definitely nailed the sentimental angle, and seems to have cashed in marvelously. That being said, this idea will start and stop with the only thing that matters - gameplay. If it's well executed I'll absolutely buy it. 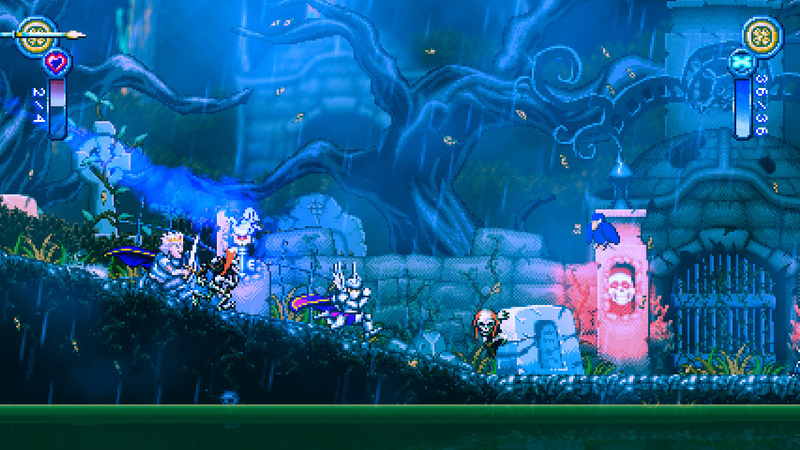 Ghosts 'n Goblins meets Magic Sword, looks great! I'm looking forward to Monster Boy and now this. @Reignmaker IDK. A female protagonist that's not overly sexualized and/or condescending in some way is still a bit rare. I can't wait to buy this. @Cosmic-K9 I'd be disappointed if the (optional) highest difficulty setting wasn't impossibly hard! I'm definitely keeping tabs on this baby now. So if he added a male option, would people consider that political pandering? Samus from Metroid. Commander Shepard from Mass Effect. Elizabeth from BioShock DLC. Laura Croft from the recent Tomb Raider games. Red from Transistor. Flux from Crashlands. Princess Rosella from King's Quest 4. Those are just a handful I've played personally and have fond memories for. However, I'm not actively searching for games with female leads because I don't feel the need to. My metric for success is tied to actual execution rather than the concept itself. Obviously others feel differently, and this developer has cashed in rather nicely as a result with his Ghosts 'n Goblins clone. That being said, I'm not hitting the instabuy button just because his daughter is in it. @Reignmaker Thank you for missing the point as expected. Also Samus was billed as male in the instruction booklet because it was to be a "fooled ya" ...the fact that it was a "surprise" that the protagonist bounty hunter was female is telling itself. Also what is the reward for beating Metroid games with a quick time? Samus in a bikini or look at her death animation. I can at least deal with the zero suit because it isn't like she can wear normal clothes under the varia suit. You aren't going to see Nathan Drake in a bikini now are you? Femshep didn't even get a unique character model until the third game in the series and male animations are used for much of her movement. Males and females move differently due to certain body parts present on one and not the other. You had to point out the recent Tomb Raider games because what was Laura known for previously? Also current her current incarnation was written by a woman, whose perspective might have had some bearing on her change from being overly sexualized. Elizabeth was the most bad arse abused hostage ever, but she still had the broken bird trope going on. I haven't played the other games you mentioned so I won't comment to them. You mentioning a handful of female characters no way negates my point. For every Samus Aran there are another 10 male protagonist characters or a female character running around in bikini armor. I'm happy you don't have to look for positive female representation in games...maybe one day I or my nieces won't have to either because it will be a given. I look forward to that day. I was merely building on my original premise that female leads aren't necessarily unique when it comes to gaming. I didn't miss your point. I just didn't address it directly, because I wasn't interested in the direction you were taking the discussion. You also weren't the only person I was responding to. Simply stated, I'm not on a crusade to defeat sexism in games. If a game looks good then I'll consider exchanging my hard earned dollars for it. I couldn't care less whether you approve of the female leads in my gaming past. If you think it's important that a wholsome, relatable girl is the hero in this game, by all means support it. But don't get mad when others may not feel as strongly on the subject as you do. Lol. this looks great and the music is very fitting. looking forward! There are some primarily in the indie scene. I'm mainly implying that it can be better. I guess AAA devs don't find them marketable unless they're Lara Croft. @CharlieSmile It's not political pandering if the female lead is there by design, like in this game both a homage to GnG series and his daughter. But when you change the Ghost busters to female because "females are funny, 'haha' get over it!" Then it's political pandering, take the discussion of making James Bond black. I mean sure he could be but he was originally designed to be white as not many people of color lived in GB back then (as compared to current day ) There is also no reason for it outside of PC-nes. @Ryu_Niiyama I am also a bit done with a lot of protaganists being causian mcgruff, with a grizzly voice and under eyebrow stare. This has nothing to do with anything but over saturation. In the 90's you had tons of videogame heroes ranging from fat cavemen to skinny slaves with tiedshut mouths( well one of em atleast). Then realism became a thing in games and everyone needed to be jack bauer and james bond or snake pliskin. Just edit the sprite patterns for GnG. This clone is ethically worse than just editing the game and giving it out for free. Call me cynical but I feel this whole pandering and using his daughter was to pull on the heart strings of the indy gaming community. @CharlieSmile sometimes a small gesture like not reading someone's reply out of sheer lazyness can break someone's day.